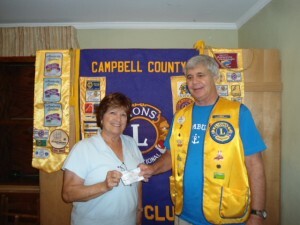 Campbell County Lions Club member Susan Vernick receives a $300 check, the top prize in a state-wide membership contest. Sue’s name was randomly chosen from all Tennessee Lions who recruited new members in the 2012-13 year. State Council Chair Richard Kulp selected her name at the Aug. 3, 2013 Multiple District 12 meeting in Nashville. She is pictured here receiving the check from her fellow Campbell County Lion, District Governor Mike McDonough. 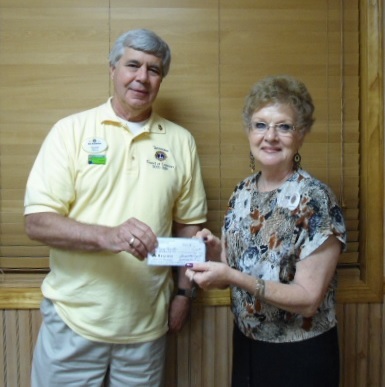 Region II Chair Peggy Chandler of the Dandridge Lions Club receives a $100 check from District Governor Mike McDonough. Lion Peggy’s name was randomly selected from all Lions in District 12-N who recruited new members in 2012-13. Congratulations and thank you, Lion Peggy!